Set in a world of swords and cloaks, of glittering palaces and mystical temples, of galley ships and ancient mist-bound cities, The Light of Eidon is the first volume of the Legends of the Guardian-King series by Karen Hancock. Abramm has dedicated the last eight years of his life to becoming worthy to touch and tend the Sacred Flames of Eidon, and he expects to be blessed for his devotion and sacrifice. But on the eve of taking the vows that will irrevocably separate him from the life he was born to—as Abramm Kalladorne, fifth son of the king of Kiriath—he is betrayed by his spiritual mentor and sold into slavery by his brothers. Swept along by the winds of a new destiny, Abramm is forced to compete as a gladiator. When the oppressed masses rally around his success, he discovers his suffering has molded him into something greater than he ever thought possible—to serve a purpose he never imagined. 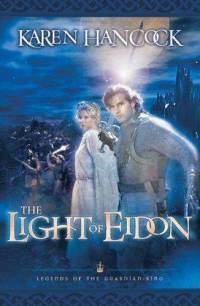 Set in a world of swords and cloaks, of glittering palaces and mystical temples, of galley ships and ancient mist-bound cities, The Light of Eidon is the first volume of the Legends of the Guardian-King series.